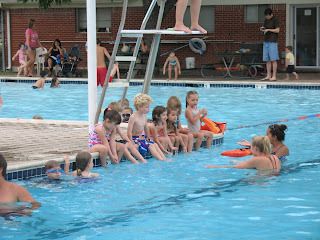 This is Jaeden's last day of swimming lessons. I have to brag for a second, sorry. After her lesson her teacher told me that Jaeden was one of the most well behaved kids she has ever taught. Go Jaeden! 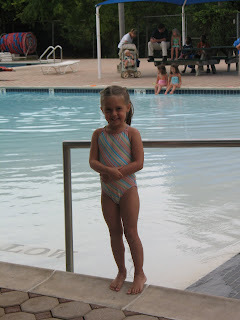 She loved her swimming lessons and can't wait for level 2 to start the end of July. I love swimming lessons!! Jaeden is so cute and she is such is such a good little girl! I miss baby Jaeden! Way to go Jaeden!! She is so sweet & looks adorable too! This is so funny to me because Tylers teacher told me/him he needed to learn to listen a little better and not wander off. I only gave him a "talking to" every day before and after class and it still didn't help. Maybe it is good they weren't in the same class, he probably would have been a bad influence. Great job Jaeden! Hi, Angie! The reunion organizers are trying to get ahold of you to send you an invitation & I didn't know your email but I did know were to find your blog. Write to westwoodhsclassof1998@gmail.com and give them your name & email.